Collectively, people think and act in ways that are different from how they think and act as individuals. Understanding these differences, says William (Bill) Bonner-a longtime maverick observer of the financial world and the vagaries of the investing public-is vital to preserving your wealth and personal dignity. From the witch-hunts of the early modern world to the war on terror, from dot-com mania to the real estate bubble, people have always been caught up in frauds, conceits, and wild guesses-often with devastating results. 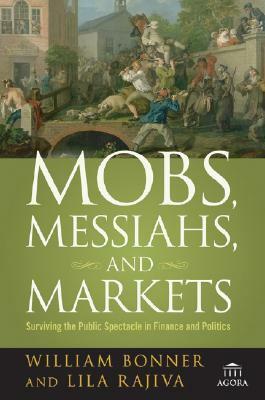 In Mobs, Messiahs, and Markets, Bonner and coauthor Lila Rajiva show groupthink at work in an improbable array of instances throughout history and reveal why swimming against the current pays. Explains why people so often abandon good sense and good behavior to "follow the crowd"
The authors' cautionary tale of bubble economies reveals how the gush of credit let loose by Alan Greenspan has wreaked havoc on our lives-but their thoughtful and always entertaining approach also offers some sound investing principles for avoiding the pitfalls of the public spectacle, thinking for yourself, and protecting your money, your sanity, and your soul. William (Bill) Bonner is President and CEO of Agora Inc., one of the world's largest financial newsletter companies (www.agorafinancial.com). He is the creator of the Daily Reckoning, a contrarian financial newsletter (www.dailyreckoning.com). Bonner is also the author, with Addison Wiggin, of the international bestsellers Financial Reckoning Day and Empire of Debt. Lila Rajiva is a political journalist and the author of The Language of Empire, a groundbreaking study of the media coverage of the Abu Ghraib prison scandal. She is a contributing editor/writer at Agora Publishing Group and the creator of the blog, The Mind-Body Politic (www.lilarajiva.com).